I needed a break after a long crush season last fall at the Berkeley wineries I work for, and what better way than a road trip to the beautiful California Central Coast. I wanted to start out with a relaxing day, so I began on the Sunday following Thanksgiving and drove down the Big Sur coast from Carmel to Cambria. It's difficult to capture the experience of driving down the coast, the highway hanging on to the steep mountainsides above with the wild coast below - truly a drive not to be missed. I enjoyed stopping at the tiny outposts of civilization that dot the remote coast south of Big Sur Valley - Nepenthe….Lucia….Gorda….Ragged Point….Piedras Blancas (where the elephant seals on the beach greatly outnumber the humans)….San Simeon - each one has something a little different to offer. On the recommendation of a couple of friends, I had dinner at Robin's Restaurant in Cambria - my first visit there, and the food and atmosphere were worthy of a return there in the future. The following day I had a late morning appointment to do some barrel tasting with Dave Corey in Santa Maria, so I had time to visit one winery along the way, and I decided to stop at Domaine Alfred. Domaine Alfred: Located in the heart of Edna Valley, just south of San Luis Obispo, Domaine Alfred's modest tasting room was uncrowded that Monday morning - I was the sole visitor. That didn't mean that they weren't busy, though - the winery's Pinot Noirs have received a lot of attention in the past year due to some impressive reviews in wine publications, and the telephone rang every few minutes with people trying to track down their highly-rated 2004 Pinots. The tasting started with the '04 Estate Chardonnay. Despite being fermented and aged in over 50% new oak, the wine retained a surprisingly crisp character. The oak, while certainly noticeable, took a back seat to the slightly tart apple and citrus flavors. Moving to reds, the '04 Estate Pinot Noir was next up. A blend of seven clones, this wine had explosive aromas of dark fruit and spices. Beautiful texture in the mouth led to a long finish. It's undeniably a big Pinot Noir but without the over-ripe character that can mar this style of wine. The '04 "Califa" Pinot Noir has received even more attention than the Estate bottling and is in short supply, so the winery was pouring an older vintage of the "Califa", the '99. If I'd tasted this blind, I'd have guessed it was a bit older than '99 - it's shed its youthful fruit but has developed some nice bottle-aged complexity, with a bit of high-toned character. The '05 "DA Red" Pinot / Syrah blend did not strike me as being as successful as some previous vintages, but being a fairly new release, perhaps it may show better with a little more bottle age. Last was the '04 Estate Syrah, another recent release. The aromas were of blackberries and coffee with just a touch of peppery spice, while in the mouth this one was medium-bodied with a fairly tannic finish. A pleasant lineup of wines, with the Estate Chardonnay and Pinot Noir being standouts. Core Wines: I continued south from Edna Valley to Santa Maria, where I met Dave Corey at the Central Coast Wine Services facility, where he makes his Core wine. In addition to his Core label, Dave also has two additional labels – Turchi and C3. We proceeded to spend well over two hours tasting 2006 wines from a dizzying variety of barrels of all shapes, sizes, and coopers – I’ve never seen a winery with so many different types of barrels as Dave has. We tasted far too many wines for me to list them all, so I've just listed some of the highlights. After the marathon barrel tasting session, Dave and I headed to Chef Rick's in Orcutt for lunch, my first visit there but it definitely won’t be my last - highly recommended. It was already mid-afternoon and I had an appointment later in the day with Peter Cargasacchi in Lompoc, but I had time to stop at one more winery on my way south. Foxen Winery: I can’t visit Santa Barbara wine country without a drive along beautiful Foxen Canyon Road and a stop at Foxen Vineyard. The wines have had some ups and downs over the years, but I think they’re hitting their stride again these days. And the funky shack that houses their tasting room is a welcome change from some of the newer and more formal tasting rooms (nice as many of them are). I tasted through the current tasting room lineup, beginning with the '05 Ernesto Wickenden Vineyard Chenin Blanc. Foxen's Chenin Blanc is consistently one the best I've tasted from California. It's completely dry, and only goes through partial malolactic fermentation so it retains very good acidity, while the barrel fermentation gives it a rich mouthfeel. Next was the '05 Tinaquaic Vineyard Chardonnay - this had citrus notes and good acidity. The '05 Santa Maria Valley Pinot Noir displayed medium color, with bright cherry, raspberry and spice aromas and flavors. I thought this was the best "basic" Foxen Pinot I've tasted in recent years and it should be a good sign for their single-vineyard bottlings to be released this spring. 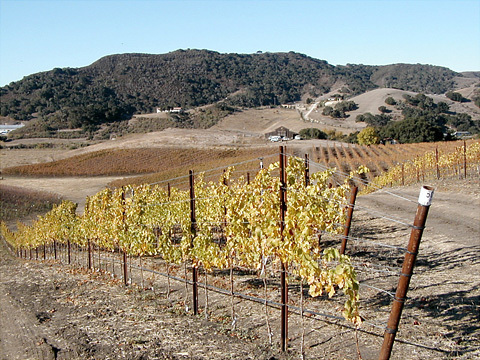 The '03 Cuvée Jeanne Marie (42% Syrah, 32% Grenache, 20% Mourvèdre, 6% Viognier), was sourced from several Santa Ynez Valley vineyards, and the Syrah and Viognier were cofermented. The wine had a wild berry and plum character, with a floral note, and was fairly tannic. The '02 Foothills Reserve (44% Cab. Franc, 41% Merlot, 15% Cab. Sauvignon) was next. The Cabernet Franc and Merlot were sourced from Westerly and Vogelzang Vineyards in Happy Canyon, at the warm eastern end of the Santa Ynez Valley AVA, while the Cabernet Sauvignon comes from Stolpman Vineyard, in Ballard Canyon between Los Olivos and Buellton. Flavors were of currents, spices, and oak, with a hint of green olive, and a rich mouthfeel. Finishing up was the '05 Late Harvest Viognier, from Vogelzang Vineyard. Very rich and fairly sweet, this wine would serve well as dessert on its own. Cargasacchi: After a brief stop in Buellton to check into my motel, I drove west to Lompoc where I met Peter Cargasacchi at “Pinot Prison” – the industrial park winery he shares with Loring Wine Company and Pali Wines. Peter can be quite the joker at times, but he’s totally dedicated and passionate about growing grapes and making wine. He was clearly excited about the quality of the ’06 vintage, one which he said challenged him as a grower but which is producing some very promising Pinot Noir. Peter started pulling barrel samples of a number of ’06 Pinots - we zipped through the barrels quickly and I barely had time to take notes. We began with two barrels of Loring Keefer Ranch, clones 115 and 777 (classic Keefer fruit, this could be even better than the excellent ’05), and Shea Vineyard clone 114 (super-dark and rich, a very big Oregon Pinot!). We sampled one wine from Pali, a barrel from the biodynamically-farmed Momtazi Vineyard, located in Oregon’s Willamette Valley. Not unlike the Loring Shea, this showed darker fruits and some spicy notes. We then proceeded to taste from some of Peter’s own barrels of '06 Pinot, from both his Jalama Road Vineyard (which go into his Point Concepción label Pinot), and his main Cargasacchi Vineyard on Sweeney Road in the Santa Rita Hills (which go into his Cargasacchi label Pinot). From the Cargasacchi Vineyard, we tasted four barrel samples, all from clone 115 Pinot Noir - free run from lots using BRL97 yeast, D80 yeast, and D21 yeast, and press wine from the BRL97 lot. The differences in the barrels between the various strains of yeast used for fermentation were subtle, though they may become more noticeable as the wines age in barrel a bit longer. There was a common theme of dark cherry and plum fruit, an earthy component, good acidity, and light to medium tannins. The biggest distinction was with the press wine, which was noticeably darker and a bit more tannic than the free run, as would be expected. 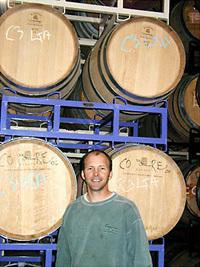 From the Jalama Vineyard, we tasted barrel samples of clone 114 and clone 828. Peter has doubts whether his planting is the “true” 828 clone, but there’s no denying that it is tasty, dense and somewhat tannic with very intense blackberry flavors. Overall, I was very impressed with Peter’s '06 wines. He has been one of the premier Pinot Noir growers in Santa Barbara County, and winemaking skills are quickly catching up with his grape-growing prowess. Finishing the day was a much anticipated dinner at the Hitching Post in Buellton. While I’ve eaten there many times over the years, this was my first Monday night dinner there…..and as all the locals know, Monday is burger night at HP! I’ve been told that the HP burgers are not to be missed, so I was really looking forward to this. I was joined for dinner by Peter Cargasacchi, John Tomasso, Dave Corey, and Peter & Rebecca Work. The burgers were indeed outstanding – nothing fancy, but big, juicy, perfectly cooked over the oak grill, and very flavorful – and they were made even better by lots of good wine and good company during the evening. Ampelos: I started out early Tuesday morning for an appointment to visit Ampelos Vineyard with Peter Work. Peter and Rebecca bought the land, just south of Highway 246 near the eastern boundary of the Santa Rita Hills AVA, in 1999, and the first vines were planted in 2001. The Works farm their vineyard biodynamically, with help from top-notch vineyard manager Jeff Newton. Their first estate wines were produced in the 2004 vintage, including their excellent λ (Lambda) Pinot Noir. Filling out the Ampelos team is son Don (also assistant winemaker at Sea Smoke) and Don’s wife Lindsay. I met Peter at his house, on a knoll overlooking his vineyard. The morning was cold and windy, not unusual fall weather in the Santa Rita Hills. After a quick overview of the Works’ property from the edge of the knoll, Peter backed a golf cart out from his garage and off we went, down the bumpy dirt road into the vineyard, the small open vehicle perfect for enjoying the bone-chilling wind! The original 15 acres of plantings in 2001 included Pinot Noir clones 115 and Pommard 4, as well as Syrah Estrella and 99 clones, plus a small amount of interplanted Viognier. About ten more acres planted in 2004 included more clones of Pinot Noir (667, 777, 828 and 2A) with some interplanted Pinot Gris, Syrah clones 383 and 470, and some Alban clone Grenache. There’s also a brand new block of Pinot in the on a west-facing hill that was planted for Brewer-Clifton. The last harvest of the year had taken place just a few days before, not surprisingly from the small block of Grenache. Although the cool climate of the area seems like it would be marginal for getting Grenache ripe, at Ampelos it got up to about 27 brix in ’06, a late-ripening year, so Peter is optimistic about its future there. As we toured the vineyard, it was obvious how deeply Peter respects the land and how carefully he is working with Jeff Newton to dial in the best vineyard practices he can for his vines. He is experimenting with different pruning (cane vs. cordon) on some vines to find out if one or the other produces better fruit. Peter also showed me some vines which have had "branchlock" clips installed to keep their shoots vertical and evenly spaced, in an effort to allow the fruit to develop and ripen more evenly. We also talked about the cover crops - legumes and various other plants – that have been planted between the vineyard rows, and which add nutrients to the soil and create a habitat for beneficial insects. In talking with Peter, it's clear that he's done a great deal of research on biodynamic farming, and he is truly committed to it as being the right path for farming his vineyard, to produce better fruit and keep the land healthy. After finishing our vineyard tour, I took off ahead of Peter and drove the short distance to Lompoc, where the Ampelos wines are made in a facility just a stone's throw from "Pinot Prison". Ampelos shares space there with Ken Brown Wines. While Peter was still on the way from the vineyard, his daughter-in-law Lindsay began the tasting with a barrel sample of the estate ’05 Pinot Noir, Pommard 4 clone, from an older barrel – medium color, very pretty aromatics of brighter cherry fruit. We continued with some of the current Ampelos releases. The '04 "Syrache" (27% Grenache, 73% Syrah) is a blend from both cool & warmer climate fruit sources. The wine had a very dark color, and intriguing aromas of both brighter and darker berries, plus a touch of mocha. The flavors followed the aromas, with a bit of black pepper character as well. Peter returned from the vineyard as I was tasting, and I commented on the beautiful new tasting counter with the large "Ampelos" logo on it. He told me that a friend had made it for the winery – it was clear that he was very pleased with it, and rightly so. The next wine was the '04 Estate Syrah, from their Estrella clone vines. Nice dark fruit with pronounced peppery, spicy character, as well as some coffee notes. The '04 Grenache is 100% varietal, sourced from Harrison-Clarke Vineyard in Ballard Canyon - very bright strawberry fruit, some spices, and nice acidity. Saying goodbye to Peter and Lindsay, I drove a few miles east from Lompoc along Highway 246 to Huber Vineyard. Huber Vineyard: Norm Huber and his wife Traudl greeted me and invited me in to their home next to the vineyard. I'd met Norm in May of 2006 at a Santa Rita Hills tasting event just prior to Hospice du Rhone. I'd never tasted his wines before that but I was very impressed. All of the Huber wines are made with fruit from their estate vineyard, which was first planted with Chardonnay and Pinot Noir nearly 20 years ago, with more recent plantings dating from about 10 years ago. The vineyard currently has about 11 acres of Chardonnay, 9.5 acres of Pinot Noir (mostly 115 clone, and some 667), and 3.5 acres of Dornfelder, a German grape variety little-known in California. Located just south of Clos Pepe Vineyard, the Huber vineyard is on relatively flat ground with sandy loam soil. The Hubers sold all of their fruit to other wineries until the 2000 vintage, when they began making wine under their own label. They still sell some fruit - among the buyers is Greg Brewer, who makes a Huber Vineyard Chardonnay for his new Diatom label. I sat down with Norm to taste his current releases, while Traudl brought in some wonderful homemade appetizers to accompany the wine. The Hubers made about 1,500 cases total in 2005, and the production will be a bit lower in 2006. 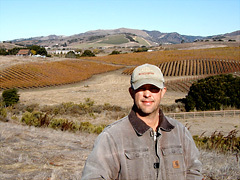 Norm Yost, of Flying Goat Cellars, is the consulting winemaker for Huber, and the wines are made in the Lompoc "Wine Ghetto", home to many small wineries from the area. We started with the '05 Unoaked Chardonnay, fermented in stainless steel and with no malolactic fermentation. A nice change of pace from most California Chardonnays, this wine is very crisp and fresh, with citrus flavors and a mineral-like note to it - a very distinctive and pleasant wine. There is also a barrel-fermented '05 Chardonnay, with 20% new oak. While there is still a bit of citrus character to this wine, the aromas and flavors lean more toward apple and pear, and there is still good acidity to go with the richer mouthfeel from the barrel fermentation. Next was the '05 Pinot Noir - medium color, sweet fruit aromas, with dark cherry and spice flavors and a touch of earthiness, a fine example of Santa Rita Hills Pinot Noir. We finished with the '04 Dornfelder - I had never tasted a wine from the Dornfelder grape before trying the one from Huber last spring, and it was quite intriguing! Inky black and amazingly viscous, this still retains nice acidity to go with the dense blackberry and plum flavors. Not surprisingly, the tannins are big, but I didn't find them overly harsh. As the Hubers had another appointment and I wanted to stop by a few winery tasting rooms that afternoon, I thanked Norm and Traudl for their gracious hospitality and made the very short drive from their vineyard to Melville Winery. Melville: Since it was mid-week, it was a relatively slow day at all of the tasting rooms I visited that afternoon, which allowed me to take my time in enjoying and learning about the wines being poured. Although the Melville tasting room has a different group of wines depending on what time of year it is, they never fail to have some terrific wines open. Melville's wines are all from sourced from their vineyards in the Santa Rita Hills and in Cat Canyon near Los Alamos. I started with the '05 Verna's Vineyard Chardonnay - it had a light gold color, and medium-sweet apple and tropical fruit flavors. The '05 Estate Chardonnay had more a more mineral character, with citrus flavors. The '05 Inox Chardonnay, like the Huber Unoaked Chardonnay, was fermented in stainless steel with no malolactic fermentaion. This was very crisp, with slightly floral aromas and green apple and citrus flavors - very nice! Moving on to reds, I tasted the '05 Verna's Pinot Noir. 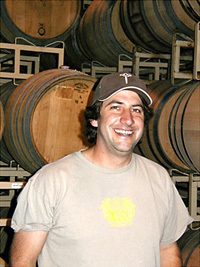 Melville is well-known for using whole cluster fermentation with their Pinots and Syrah. The stems from the whole cluster fermentation typically impart a spicy character as well as tannins, while they also tend to lighten the wine's color. The '05 Verna's Pinot used 40% whole cluster, and had a medium color, with tart cherry and tea leaf notes in the flavors. I liked the '05 Estate Pinot Noir better - while this also used 40% whole cluster fermentation, this blend of 14 Pinot clones had dark cherry and plum aromas with a distinctly spicy character and a rounder mouthfeel than the Verna's Pinot. Next was the '04 Verna's Vineyard Syrah, with 25% whole cluster - dark purple color, plummy aroma with hints of olives, and lightly tannic. Finally, the '04 Donna's Syrah, with 10% whole cluster, displayed blackberry fruit along with coffee and spices, and richer mouthfeel than the Verna's. As usual at Melville, a solid lineup of wines that showcase Santa Rita Hills and Santa Barbara County very well. Alma Rosa: Continuing east along Highway 246, I drove into Buellton to stop at Alma Rosa Winery. "Camp Alma Rosa", the winery's temporary tasting room, is located in a small industrial park in Buellton. The tasting room will move to the old Sanford tasting room on Santa Rosa Road sometime this year. Behind the tasting bar was Mel Lewis, who, along with Chris Burroughs (of Sideways fame), followed Richard Sanford to his new Alma Rosa label. Most of the wines are sourced from two estate vineyards - El Jabali, along Santa Rosa Road near the old Sanford tasting room, and La Encantada, several miles farther west along the south side of Santa Rosa Road. Mel began by pouring the '05 La Encantada Vineyard Pinot Gris - this had a slightly floral character with mineral notes and great acidity, maybe the best Pinot Gris I've tasted from this area. The '05 La Encantada Vineyard Pinot Blanc showed a rich mouthfeel, with pear and citrus flavors, very pleasant. The '05 El Jabali Vineyard Chardonnay had bright tropical fruit flavors and good acidity. The '05 Santa Rita Hills Pinot Noir, a blend of six clones, was excellent, with cherry and darker fruit aromas, with added spicy character in the flavors, and smooth mouthfeel. Finally, the '05 La Encantada Vineyard Pinot Noir, from three clones, had a similar character to the Santa Rita Hills bottling but with more intensity and richness, and a great mid-palate and finish. Among a lot of excellent Pinot Noirs I tasted on my trip, I thought this one stood out as the finest of them, a wonderful example of what a great Santa Rita Hills Pinot can be. Beckmen Vineyards: From Buellton, I drove the short distance to Los Olivos for a stop at Beckmen Vineyards just east of town. Beckmen has some of the most consistently fine wines in the area, and is always worth a visit. I tasted through many of their current releases and found several highlights. The '05 Purisima Mountain Vineyard Sauvignon Blanc was a ripe style, yet maintained good freshness. The '05 Le Bec Blanc, a blend of Roussanne, Marsanne, and Grenache Blanc, had aromas of apricot, peach, and spice, with a fairly rich mouthfeel. The '04 Cuvée Le Bec, a southern Rhône-style blend, had a nice balance of earthy and fruit character from the large percentage of Mourvèdre used, and had good structure for aging. The '03 Purisima Mountain Vineyard Syrah was dense and rich, with dark fruit and mineral character and substantial tannins. Finally, the '04 Purisima Mountain Vineyard Clone 1 Syrah was even richer, with more intense fruit aromas and some coffee notes. Rusack: As the late-afternoon shadows were beginning to grow longer, I decided to take the scenic route from Los Olivos back to my motel in Buellton, along Ballard Canyon Road. Rusack Vineyards is about halfway along the road so I made one last stop for the afternoon. They did not have most of their higher-end wines available for tasting, so most of the ones I tried were their "basic" bottlings. The '05 Santa Ynez Valley Sauvignon Blanc was very crisp, with predominantly citrus flavors. The '05 Santa Barbara County Chardonnay was good but not as compelling as some of the others I'd tasted that day. The '05 Santa Barbara County Pinot Noir had dark cherry fruit and spice character and was a reasonably good QPR wine. The '04 Santa Barbara County Syrah was the best of the wines that Rusack poured when I was there, with dark fruit, spice, and rich mouthfeel. The tannins suggest it will age well but they are not harsh enough to preclude enjoying this wine now. Last was the '04 Santa Barbara County "Anacapa" Cabernet Franc based blend, a very pleasant wine with dark berry flavors, some oak, an herbal note, and moderate tannins. Some good wines, but having tasted some of the Rusack reserve wines in the past, I know those are a big step up from most of the "Santa Barbara County" bottlings, and I'm hoping to be able to taste some of those reserves on my next visit. Funniest sign seen on the trip, outside the Consilience tasting room in Los Olivos: "Not Seen in Sideways". Wednesday morning I drove to Santa Barbara to pick up some wine for a couple of friends at the Wine Cask. After stopping to drool over the great wine selections at the Wine Cask and at Lazy Acres Market, I headed back north, enjoying the spectacular views as I drove up and over San Marcos Pass along Highway 154. Stopping for lunch at Los Olivos Grocery – great deli sandwiches as well as a fine selection of wine and cheese – I continued north to Paso Robles for a visit with Larry Roberts at the new Paso Robles Wine Services facility, near the airport a couple of miles north of town. A much nicer facility for winemaking than at the old location on the other side of town, the new building was opened just in time for crush last fall. Redline Wine: Larry launched his new Redline label last year, making the change from his previous hard-to-spell and hard-to-pronounce label Caernarvon. Redline focuses on Syrahs from vineyard sources as far away from Paso Robles as Eaglepoint Ranch in Mendocino County. Besides his own Redline label, Larry is the winemaker for a couple of other local wineries, Penman Springs and Vista Del Rey. Grabbing a wine thief and flashlight (it's dark between rows of barrels stacked five or six high! 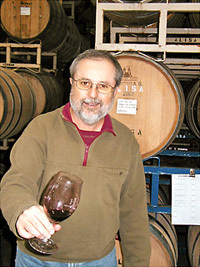 ), Larry proceeded to pull samples of a wide variety of wines from the three labels. We switched back and forth from one label to another during our tasting, but I've grouped the wines by winery here. Some really intriguing wines, and I especially enjoyed the Redline Syrahs - even though they are all big wines and not shy with oak, they display distinct differences between their various vineyard sources. Hug Cellars: It was already getting to be late afternoon by the time I said goodbye to Larry and left Paso Robles Wine Services. 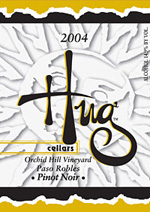 I had arranged a quick visit to Hug Cellars - although Augie Hug was out of town on business, Raquel Rodriguez was at the tasting room and winery along Highway 46 on the eastern edge of town. Augie and Raquel are two of the friendliest people you'll find in the wine business, and it's always a pleasure to visit. Although I was a bit short on time, I did manage to check out Hug's '06 Bassetti Vineyard Syrah with Edgar Torres, their assistant winemaker. Bassetti may be the coolest-climate Syrah vineyard site in California, and the fruit had just been picked three days earlier (the Sunday after Thanksgiving) so it was still cold-soaking in three large bins. Augie had told me earlier that this was the latest pick he's made at Bassetti, due to the growing season in '06. The fruit did not get as ripe as Augie tends to prefer, but what was in the bins looked and tasted great. I enjoyed dinner in Paso Robles with Raquel and Larry Roberts & his wife Lisa at Artisan, a new restaurant just a couple of blocks from the center of town. Though it had only been open for a few weeks and there were still a few minor kinks to work out with the service, the food was excellent. A very good sign….there were a number of other winemakers dining there - Matt Trevisan of Linne Calodo with his wife Maureen and their family, Roger Nicolas of RN Estate Vineyard, Claudine & Terry of Clautiere Vineyard, and a couple of others as well. Linne Calodo: I had not planned to visit Linne Calodo on this trip, but when I bumped into Matt Trevisan at dinner and he invited me to visit him at his winery the next morning, it was too tempting to pass up. Another day, another marathon barrel tasting! I met Matt at his winery just off of Vineyard Drive west of Paso Robles. The existing small winery building is packed full of barrels and Matt is in the process of obtaining permits for a new building. He got in about 90 tons of fruit in '06, and it looks like that's about all his current building can handle. He's also putting in some new plantings on the property - 174 & 877 Syrah clones, Grenache, Tannat, Mourvèdre, Grenache Blanc, and Picpoul Blanc. Matt led me back into the tall stacks of barrels and we began tasting. Matt is known for pushing the ripeness envelope on many of his wines, and they're clearly not for everyone. But as big as these wines are, I think the fruit and alcohol usually stay in balance nicely. Matt has talked about pulling back from the very ripe style of wines he's made in recent years, and my sense in tasting his '06 barrel samples was that they are a step in that direction. Anglim: The final wine visit of my trip was to the tasting room of Anglim Winery in Paso Robles. Steve and Steffanie Anglim started their winery in 2002 and opened their tasting room in 2005. The tasting room is located in the restored train station building just a couple of blocks from the downtown city park in Paso Robles. Steffanie was behind the tasting counter, and she poured me their current releases. First was the '04 Fralich Vineyard Paso Robles Viognier - this had a distinctly floral aroma, with apricot and peach flavors, and was quite rich. In contrast, the '04 Santa Barbara County Viognier (with about 20% Roussanne) was a leaner style with less floral aromatics, more stone fruit and citrus flavors, and showing a touch more oak. Next was the '05 Paso Robles Roussanne, which showed good acidity along with its apple and peach flavors. The '05 Rosé of Syrah, sourced from several Paso Robles vineyards, had a very light color, with bright strawberry aromas and an added touch of spice in the flavors. Moving to the reds, the '04 Paso Robles Grenache (with about 20% Syrah) was fairly light in color, with strawberry aromas and flavors, and medium tannins. The '03 Fralich Vineyard Paso Robles Syrah was medium purple color, and had plum and blackberry flavors with a slight meaty character. Finally, the '03 French Camp Vineyard Paso Robles Syrah was not unlike the Fralich bottling in its flavors but had richer mouthfeel, some black pepper notes, and was a bit more tannic. Overall, the Anglim wines struck me as being very pleasant and well-balanced, with exceptional value as well - only one of the wines I tasted was more than $24. The wines all have ripe character, without seeming over-ripe - nice balance throughout. There is no part of California wine country that I enjoy visiting more than the Central Coast. The scenery is gorgeous, the people are friendly and more than willing to share their passion about their vines and wines. And on top of it all, the wine from the Central Coast is good and seems to get better with every passing year. There seems to be an inherently relaxing atmosphere throughout this area, so despite the number of wineries I visited on this short trip, it still ended up as a perfect break for me. As always, thanks to everyone that I visited for being so generous with their time and their wine!